Theropod dinosaurs, widely accepted as the ancestors of birds, do not show a step-by-step gradational change to Archaeopteryx, the first known bird. The vast majority of traits reverse themselves at least once in the cladistic sequence. Those traits that do change in a unidirectional manner often show large jumps in the sequence. Ironically, the most bird-like of theropods (including the much touted feathered ‘theropod,’ Caudipteryx), are now apparently confirmed (under evolutionary presuppositions) to be nothing more than ‘secondarily’ flightless descendants of Archaeopteryx! Theropods fail as stratomorphic intermediates, occurring much too late in the stratigraphic record to serve as the ancestors of birds. The course of volant (flying) bird evolution itself is also full of discontinuities and trait reversals. Late Mesozoic birds fail to display a smooth connection either backwards to Archaeopteryx or forward to modern birds. A recently published, comprehensive cladistic study of bird evolution by Maryanska et al.5 only adds fuel to the fire. Based on analysis of the many relevant specimens housed in Poland, Mongolia, and Russia, and relying on 195 skeletal characters of theropods and early birds, it facilitates a thorough examination of the relationship between theropods and early birds. Another recently published study, by Zhou and Zhang,6 based on 201 skeletal characters, complements the first. It allows for the tracing of avian evolution itself, spanning the supposed evolutionary continuum that exists between the dromaeosaurids as outgroup, on the one hand, and modern birds, on the other, as the crown group. (Note that the outgroup is immediately outside the inferred evolutionary progression, and is used as a reference point for the ‘primitive’ condition, whereas the crown group consists of the most derived members of the inferred evolutionary progression). Although both the choice of characters and some aspects of their scoring involve a certain element of subjectivity, the data sets used for cladistic analyses allow for a relatively objective, semi-quantitative analysis of alleged evolutionary changes. As usual with cladistic analyses, the vast majority of anatomical traits are scored as a present-absent (0 or 1) polarity in each organism. Only a few traits get scored according to an incremental appearance of a trait (0, 1, 2, 3, etc.). Table 1. The inferred course of evolution from theropods to Archaeopteryx and back to land-limited creatures. In the cladistic analyses cited here, the organisms are lined up as ‘signposts’ leading to the successive emergence of avian traits, but with no necessary connotation of ancestor-descendant relationships.14 The clades and their respective constituents are listed in Tables 1–4. In Table 1, four theropod groups serve as one reference point (the outgroup) and modern birds (not shown in the cited study, nor in Table 1) the other. In order to avoid the circular reasoning15 behind any assumption of a common evolutionary process grouping a set of traits (and then saying that the resulting cladogram supports that inferred evolutionary sequence), each of the 195 traits in the original study have been equally weighted and reckoned to be independent from each other. Note that the Clade Avialae (Table 1) corresponds to the vernacular term ‘birds.’16 The order of the clades shown in Table 1 is reversed from the original data so that the inferred course of evolution proceeds upward, in synchrony with the course of evolution showed in Tables 2–4. Extant birds, which include the duck and the chicken, are prefixed with (Class) Aves in Tables 2 and 4. These five birds constitute the crown group. Table 2. The entire course of avian evolution, emphasizing volant birds. Each listed taxon in Table 1 is the primitive sister group of the entire assemblage of taxons listed above it. In contrast, the course of volant (flying) bird evolution (Table 2) has a less straightforward, nested branching sequence. Only the six basal taxons each constitute a primitive sister group of all the combined taxons above them. The Gobipteryx-Cathayornis cluster (itself complexly branched within) is the sister group of the Patagopteryx-modern-bird cluster (itself complexly branched within), with Confuciusornis inferred to be the primitive sister group of both combined clusters. In Table 3, the simple sister-group relationship of each basal taxon relative to its combined successors (identical to just the lower part of Table 1) eliminates the need for sketching the branching patterns. However, the complex branching relationship that is inherent to the closing stages of avian evolution (Table 4) forces the addition of these patterns as had been done in Table 2. A major difficulty in using the second dataset4 is the very large fraction of information that is missing. In order to minimize biases introduced into the Avian Indices, two different approaches were used in evaluating the available data. In order to preserve information pertinent to the entire course of volant bird evolution, the entire sequence from Dromaeosauridae all the way to modern birds was retained despite the severe loss of data (only 37 of 201 traits found useable, of which 21 were nonreversing), and presented as Table 2.17 Owing to the massive loss of data, combined with the fact that the Gobipteryx-Cathayornis clade had accounted for a disproportionate share of this loss, this clade was eliminated from further consideration. The remaining information was divided into Early (Table 3) and Late (Table 4) volant bird evolution. This greatly minimized the loss of data, as each dataset could now be normalized according to only the relatively few absent data points encountered over the short interval of its span. In both Table 3 and 4, 131 of the original 201 data points now qualify for analysis. Table 3. The emergence of early birds: subset of Table 2. Throughout the theropod-bird sequence (Table 1), there does appear to be an almost monotonic progressive emergence of avian traits throughout the sequence. There is, however, an apparent reversal in the Avian index in the theropods immediately preceding the first known commonly acknowledged bird, Archaeopteryx. Moreover, a closer look at the data indicates that the apparent smoothness of the overall progression is misleading. To begin with, as always, the normalization process itself favors the evolutionist.18 Furthermore, the inclusion of reversed traits tends to smooth over the overall sequence.19 A striking 140 of all of the 195 traits reverse at least once, and this large total rises to 145 if the four outgroup theropod groups are included. Furthermore, of the 140 within-sequence reversing traits, 64 of them do so at least twice. Consequently, the majority of key avian traits do not progress towards the avian condition! Instead, what we have is a highly variegated collection of avian-reptilian mosaics. Now consider only the progressive traits. This sequence is characterized by sharp jumps in the presumed acquisition of avian traits. Note, for instance, the almost doubling of the Avian Index with the respective emergence of the Eumaniraptora and ‘C’ clades. There is also a hefty discontinuity between Dromaeosauridae and Troodontidae. The two clades that immediately precede Archaeopteryx are, ironically, more birdlike in skeletal morphology (with reference to modern birds) than Archaeopteryx itself! Table 4. The most recent stages (including crown group) of bird evolution: subset of Table 2. Ironically, it seems that the evolutionists have now dug themselves into an even deeper evidentiary hole. Not only are they lacking a step-by-step appearance of major adaptations for flight, but now they also lack a step-by-step disappearance of these adaptations in the case of the ‘secondarily flightless’ oviraptorosaurs! Some evolutionists insist that evolution must be true if for no other reason than the fact that certain ‘intermediate-structured’ fossils can always be found in the right portion of the geologic column. Unfortunately, some professing creationists have also fallen for this spurious line of reasoning. The stratomorphic-intermediate argument would only be valid if: (1) The time-stratigraphic interval in question contains only one group of potentially qualifying structural intermediates and, reciprocally, (2) Putative structural intermediates occur only in the correct stratigraphic interval where they are needed according to evolutionary theory (to bridge two other groups into an evolutionary sequence). Consider, for a moment, the mammal-like reptiles. They are perhaps the supreme example of stratomorphic intermediates. But consider what would have happened had they never existed or had never been discovered. Evolutionists, following the lead of ‘Darwin’s bulldog,’ Thomas Huxley, would probably cite ancient amphibians as the ancestral group to mammals. Some extinct amphibian group would then be designated the stratomorphic intermediates that bridge non-mammals and mammals.23 This violates condition (1). In the present study, the theropods expose the fallacy of stratomorphic intermediates by directly contradicting condition (2). They provide an outstanding example of organisms that qualify to some degree as morphological intermediates in a would-be evolutionary progression, only to occur in the wrong part of the geologic column to serve as transitional forms. Earlier claims of Late Triassic footprints had been challenged, and the footprints ascribed to non-avian dinosaurs. However, the cited authors assert that these newly discovered footprints are incomparably more aviform in structure than the earlier-claimed ones. We now turn our attention to the presumed lineage that culminated in modern birds as the crown group. If we accept Archaeopteryx as the first bird, then how did more modern birds supposedly evolve from it? When placed in the context of the full history of bird evolution (Table 2, All Traits), it becomes obvious that Archaeopteryx is both preceded and succeeded by major discontinuities in the Avian Index. As for progressive traits alone, none of them can be traced all the way from the presumably ancestral dromaeosaurids all the way to modern birds.32 However, the remaining progressive traits in Table 2 indicate a second major discontinuity in early bird evolution—that between Confusciusornis and its primitive sister, Sapeornis. On the other side of Confusciusornis is a large gap (14.3 vs 31.3) between it and even the least derived members of its advanced sister-group complex. A ‘magnifying lens’ view of the inferred early evolution of birds (Table 3) only magnifies the discontinuities (pardon the pun). The relatively small step from dromaeosaurids to Archaeopteryx, smoothed over in the All Traits column, expands in the Progressive Traits column. The Avian Index doubles from dromaeosaurids to Archaeopteryx, only to have to double once again from Archaeopteryx to Rahonavis. In the All Traits column, there is a virtual chasm (a quadrupling of the Avian Index) from Archaeopteryx to Rahonavis. There is another big leap (an almost doubling of the Avian Index), from Sapeornis to Confuciusornis, in both the All Traits and Progressive Traits columns of Table 3. As if all this were not enough, 21 of the 131 useable traits used for Table 3 reverse themselves at least once in the evolutionary sequence. As elaborated by modern creationist scientists, there are no known creatures, leading up to Archaeopteryx, that have half-wing/half-leg structures.34 And, in spite of the apparent or actual existence of ‘feathered theropods,’ the supposed evolutionary origin of feathers remains problematic.35 Nowadays evolution is said to occur in a mosaic fashion, and this is supposedly justified by evolutionary changes in developmental pathways, relative to embryonic development.33 But, as noted earlier, embryonic development can soundly contradict accepted evolutionary schemes, notably the theropod-to-bird dogma.3 A second inescapable fact also remains: evolutionists have lowered their standards for what qualifies as evidence. Failing to find fossil animals showing comprehensive intermediacy between reptiles and birds, they are now forced to patch together a ‘series’ of fossil animals that merely show a variegated assortment of reptilian and avian traits. The most recent stages of bird evolution are also beset with trait reversals and discontinuities. Apropos to the former, 29 of the 131 useable traits contained in Table 4 reverse themselves at least once. As for the latter, consider how the Avian Indices would be distributed in Table 4 if they were smoothly gradational. The All Traits would proceed at or near the following values: from 50.5 to 62.8 to 75.1 and culminating in 87.4 (the modern bird having the smallest value for the Avian Index in All Traits). The corresponding values for the Progressive Traits would also begin with 50.5, proceeding to 66.7 and 83.4 before culminating in 100 (the modern bird having the smallest value for the Avian Index in Progressive Traits). The reality behind the Avian Indices relevant to recent bird evolution (Table 4) is actually quite different. There is a sharp gap between Patagopteryx and its advanced sister group, the Apsaravis-modern-bird cluster. This discontinuity shows up in both columns of the overview of volant bird evolution (Table 2) as well as both columns of the close-up view of recent bird evolution (Table 4). Finally, the Avian Indices of the most recent sister groups of modern birds must be put in perspective. Note that there is substantial variability in the Avian Index of the five chosen recent birds.36 In the All Traits column of Table 4, the Avian Indices of Ichthyornis and Apsaravis are just over 8 units below Anas, but the corresponding distance from Anas to Crax is also 8 units. Consequently, the presumed evolutionary change, from Ichthyornis through Apsaravis to modern birds, is unimpressively small. As if this was not enough, the most birdlike part of the theropod progression belongs not to the supposed ancestors of the first known bird, Archaeopteryx, but to the oviraptorosaurs, a descendant branch of ‘secondarily flightless theropods.’ And, of course, the ‘secondarily flightless’ status of these oviraptorosaurs begs the question about the need for volant ancestors. The need for evolutionists to invoke this complex scenario of events serves as a reductio ad absurdum of evolutionary theory. Instead of invoking a back-and-forth evolutionary process of land animals to birds and (in the case of oviraptorosaurs) back to land animals, how much more sensible it is to discard evolution altogether and to accept special creation instead! Owing to the fact that the Creator was under no obligation to use a nested hierarchy of created living things, at least in every case, it is not difficult to understand why evolutionists have such problems in their attempts to force ‘nonavian’ and ‘avian’ traits into any sort of evolutionary lineage. The final irony of all this is the fact that, contrary to the predictions of those who favor the argument about stratomorphic intermediates, known theropods occur in the wrong place in the stratigraphic column to serve as ancestors to birds. The evolution of relatively modern birds is also full of discontinuities and reversals of traits. Overall, modern birds show a less than impressive gradational connection to presumably earlier birds, and least of all to Archaeopteryx. The variability among modern birds is significant,37 and increasing this range of variability by severalfold would be sufficient to encompass the entire range of Avian Indices found among the birds listed in Table 2. Considering the fact that the extant (post-Flood) biosphere is very impoverished compared with the pre-Flood biosphere, this is not difficult to comprehend. John Woodmorappe has an M.A. in geology and a B.A. in biology, from a midwestern US state university. He is a science educator by profession. He is the author of Studies in Flood Geology, Noah’s Ark: A Feasibility Study, and The Mythology of Modern Dating Methods. Camp, A.L., On the alleged dinosaurian ancestry of birds, <www.trueorigins.org/birdevo.asp>, 1998–2000. Return to text. Oard, M.J., Bird-dinosaur link challenged, TJ 12(1):5–7, 1998. Return to text. Sarfati, J., Ostriches break dino-to-bird theory, Creation 25(1):34–35, 2002. Return to text. Olson, S.L., Open Letter to: Dr Peter Raven, Secretary, Committee for Research and Exploration, National Geographic Society, 1 November 1999. Return to text. Maryanska, T., Osmolska, H. and Wolsan, M., Avialan status for Oviraptorosauria, Acta Paleontologica Polonica 47(1):97–116, 2002. Return to text. Zhou, A. and Zhang, F., A long-tailed seed-eating bird from the Early Cretaceous of China, Nature 418:405–409, 2002. The 201 traits, and the matrix relating them to other vertebrates, is presented as Supplemental Information at the Nature website, <www.nature.com/nature>. Return to text. Woodmorappe, J., The nontransitions in ‘human evolution’—on evolutionists terms, TJ 13(2):10–12, 1999. Return to text. Woodmorappe, J., Mammal-like reptiles: major trait reversals and discontinuities, TJ 15(1):44–52, 2001. Return to text. Lamb, A., Livoniana—have they (finally?) found a missing link? TJ 16(1):4–6, 2002. Return to text. Woodmorappe, J., Walking whales, nested hierarchies and chimeras: do they exist? TJ 16(1):111–119, 2002. Return to text. For example, suppose that a taxon has 140 of the 195 traits scored (the 55 are missing or unknown for the specimen(s) studied). The 140 traits accumulate a total of 70 points for an All-Trait Avian Index of 50 (70/140 x 100). Return to text. When all of the members of the cladogram experience an evolutionary change in a unidirectional direction for a particular trait, this is considered a progressive trait. Examples of progressive traits are (0001122344) and (0000011111). By contrast, whenever a trait is inferred to change from a more derived state back to a less derived one at least once in the accepted evolutionary sequence, this is considered a nonprogressive trait. Examples of nonprogressive traits are (0010112223) and (0111232334). Return to text. For example, a trait found in Confuciusornis is considered to reverse only if all the members of the Gobipteryx-Cathayornis subclade (out of the entire Gobipteryx-modern-bird sister group of Confuciusornis) score lower on that particular trait than Confuciusornis itself. The criteria used for recognizing reversing groups within the subclades are even stricter (i.e. made favorable to the evolutionist). For example, a trait encountered in Ichthyornis, the primitive sister group of all modern birds, is recognized as reversing only if all the five reference modern birds in Table 2 score lower on that particular trait than Ichthyornis itself. Return to text. Use of modern birds as the reference point only implies movement towards an eventual outcome and does not, of course, imply that the evolutionary process was goal-oriented in any way. Return to text. Lee, M.S.Y., Circularity, evolution, systematics … and circularity. J. Evolutionary Biology 12:724–734, 1999. Return to text. Maryanska et al., Ref. 5, p. 102. Return to text. The 37 traits are those that had shown some continuity over each major stage of bird evolution. Specifically, each of the 201 prospective traits had to simultaneously include data in each of the following stages of bird evolution: At least: 7 of 10 premodern birds, 4 of 6 of the most primitive entries listed, and 2 out of 3 members of the following: Patagopteryx, Apsaravis, and Ichthyornis. The 37 qualifying traits are: 56-58, 67, 83, 85–87, 90, 92, 94, 99, 101, 105–107, 110, 111, 113, 114, 119, 131, 139, 141, 148, 150, 165, 166, 177, 178, 180, 182, 186, 188, 190, 195, and 199. Of these, the following 21 were nonreversing: 56, 67, 85, 90, 94, 99, 101, 106, 107, 111, 119, 131, 148, 150, 165, 166, 178, 180, 186, 190, and 195. Return to text. The normalization process always gives the evolutionist the benefit of the doubt in the many instances of absent data. This strongly favors the evolutionist by holding down the apparent frequency of reversing traits. This owes to the fact that new data can never change a reversing trait to a nonreversing one, but can easily do the reverse. Consider, for instance, a hypothetical reversing trait that contains the following sequence of scores (0001?11211). No possible value for the absent point (?) could ever change the sequence to a nonreversing trait. Now consider the following trait and its hypothetical sequence of scores: (0001?11122). The missing data point (?) is treated as neutral, allowing the sequence to be reckoned as nonreversing, and of course favoring the evolutionist. But note that any value other than 1, for the missing data point, will instantly change the nonreversing sequence to a reversing one. Were a heavier burden of proof placed on the evolutionist, commensurate with his usual evolution-is-fact mantra and slogan, no normalization would be performed. Instead, missing data would be treated as a liability for evolution. That is, missing evidence would then count as an absence of evidence for evolution, as opposed to merely counting the existing evidence for versus against an evolutionary progression, instead of unknown evidence that could go either way. If this was done, the ‘progressive’ appearance of traits (avian, in this case), as reflected by the Avian Index, would be quite puny. Return to text. For description, see Woodmorappe, Ref. 8, p. 45. Return to text. Maryanska et al., Ref. 5, p. 98. Return to text. Maryanska et al., Ref. 5, p. 105. Return to text. Maryanska et al., Ref. 5, p. 106. Return to text. Woodmorappe, Ref. 8, p. 51. Return to text. Melchor, R.N., de Valais, S. and Genise, J.F., Bird-like fossil footprints from the Late Triassic, Nature 417:936–938, 2002. Return to text. Dodson, P., Origin of birds: the final solution? American Zoologist 40:505–506, 2000. Return to text. Dodson, P., Mesozoic feathers and fluff, American Paleontologist 9(1):7, 2001. Return to text. Padian, K., Comment, American Paleontologist 9(4):12–13, 2001. Return to text. Wells, J., Icons of Evolution: Science or Myth? Regnery Publishing, Washington D.C., 2000. Actually, Jonathan Wells is an Intelligent Design scholar, and probably does not consider himself a creationist. Return to text. Obviously, Padian’s understanding of testing phylogenies is entirely self-referential to evolution itself. Return to text. How many times have creationist scientists heard that one before! Return to text. Dodson, P., Response by Peter Dodson, American Paleontologist 9(4):13–14, 2001. Far from endorsing the special creation of birds, Dodson is merely giving an evolutionary alternative by suggesting that the actual ancestor to birds may be found in earlier strata. Return to text. This is caused by the large amount of missing data, as elaborated earlier. Return to text. Lock, A. and Peters. C.R. (Eds), Editorial introduction to Part III; in: Handbook of Human Symbolic Evolution, Clarendon Press, Oxford, p. 372, 1996. Return to text. Frair, W., Review of Taking Wing, CRSQ 36(1):9–10, 1999. Return to text. 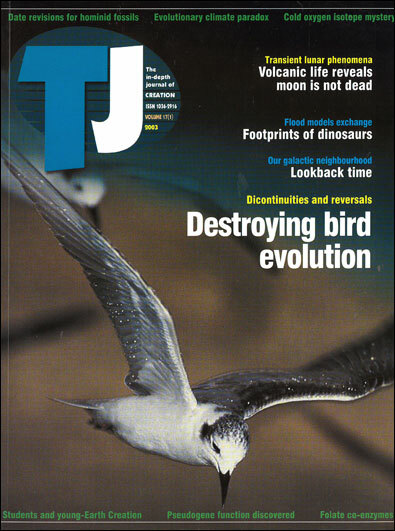 Bergman, J., The evolution of feathers; a major problem for Darwinism, TJ 17(1):34–42, 2003. See also Rossmann, T., Feathered or furry dinosaurs? TJ 16(3):19, 2002. Return to text. The disparity between the variance of successive sister groups (of clades that include modern birds), and that which exists between modern birds themselves, is much greater in the Progressive Trait column of Table 4 than in the All Traits column. However, the Progressive Trait column of Table 4 is, in this exceptional situation, not as reliable as the All Traits column for the following reason. Members comprising the crown group (modern birds) have almost no missing traits, whereas the three successive sister groups (of clades that include modern birds), contain a large fraction of missing data. This introduces the following bias: The Avian Indices in the successive sister groups (namely Patagopteryx, Ichthyornis, and Apsaravis) are very disproportionately depressed relative to the Avian Indices of modern birds. Return to text. Of course, there is no guarantee that the five modern birds chosen by the initial investigators, and listed in Table 2 and Table 4, necessarily encompass the entire range of relevant morphological variability that is found in extant modern birds. Return to text.